There’s a wonderfully poignant scene in Pride where Imelda Staunton’s character, Hefina, sits with one of the elder statesmen of their small mining village buttering sandwiches. As they go about this mundane task facing the static, Ozu-esq, camera, discussing their new found solidarity with Gay Pride, the man makes the bold admission he himself is actually gay. To this startling revelation Hefina merely replies “I think I’ve known that since 1968”, and with that they carry on buttering away their sandwiches like nothing has happened. This short, understated scene confirms that Pride, like The Full Monty, Made in Dagenham and Billy Elliot before it, has that quintessentially British charm about it. Intangible and inexplicable, it’s a trait characterised by a blend of personally resonant history and endearing idiosyncratic humour, unmistakably lifted from our small nations. 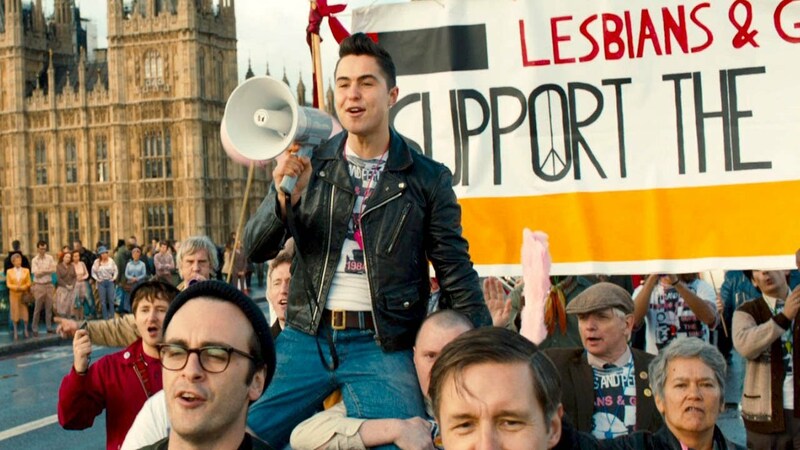 Pride triumphs in the aforementioned; it’s got humour, drama, history and bags of heart that make for one of the most uplifting and enjoyable films of the year. Straight from the off Pride sets out its ambitious scope to spin a yarn that doesn’t content itself with one character’s perspective on proceedings, as the audience is fed the differing tales of two young men; Joe (George MacKay) a pale and timid mummy’s boy straight from the middles class suburbs, and Mark (Ben Schnetzer), a handsome and charismatic greaser living independently of any sort of family. While these two appear polar opposites they’re both kindred spirits in their sexuality, a fact that soon becomes apparent when their contrasting walks of life lead them to a Gay Pride march in London.